Sheet vinyl flooring is an affordable and versatile floor covering option. Because of vinyl's high level of moisture resistance and low maintenance requirements, homeowners often choose vinyl floors for kitchens, bathrooms and other areas subject to moisture. 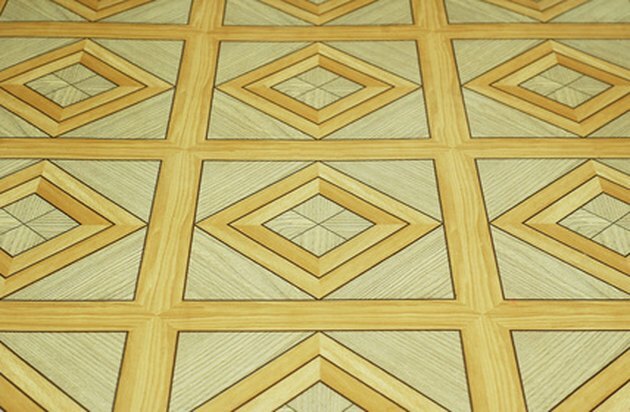 With proper preparation, this material can be installed over almost any type of subfloor, including existing ceramic tile, and can enhance the look of your home. Vinyl flooring offers a wider range of patterns and color choices than most ceramic tile products. Remove broken or damaged sections of ceramic tile. Sweep or vacuum the entire floor surface to ensure all dust and loose tile pieces have been removed. Fill all holes and cracks in the floor using liquid cement. Choose a product with a built in applicator or pour this product into the cracks and trowel it smooth, wiping away any excess. Allow the cement to dry before proceeding. Coat the entire surface with an embossing compound to conceal grout lines and texture. Use a trowel to apply this material until the entire surface is smooth and even. Wait for the embossing compound to dry completely before proceeding with installation. Measure the length of the room using your tape measure. Unroll the vinyl and use a pencil to transfer this measurement to your roll of sheet vinyl. Cut the vinyl along this mark using your utility knife. You may need to score the material several times to cut it. Use a heat gun to warm the vinyl for 30 seconds to make it more pliable if you are having difficulty making cuts. Repeat Steps 4 and 5 to measure and cut the remaining vinyl to the required size. Apply vinyl flooring adhesive to the coated ceramic surface using a notched trowel. Allow the adhesive to sit on the floor for a period of time (check the label) until it is tacky enough for vinyl installation. Roll the vinyl carefully out onto the adhesive. Use a 100-pound floor roller to immediately roll each section as you install it, working from the center of each section out to the edges. Repeat this process as you work your way across the floor. Apply a vinyl seam sealer to all seams using the sealer's built-in applicator. Wipe away any excess material and allow the floor to dry overnight before walking on it.